Buck, aka Who's Smoken, is a handsome two-year-old fawn male born January 5, 2002. Buck's sire is Peek Aboo BigBoy, and his dam is I'll Say She Can. 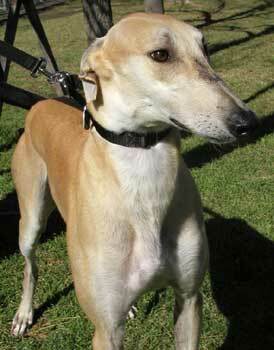 His grand sire is Wigwam Wag, and he is brother to Captain! Buck spent some time being a blood donor in Harlingen after finishing his last of two races at Valley Race Park on December 3, 2003. Buck is affectionate and gentle for such a big boy (but he's not as big as Captain). It is not known at this time if Buck is small animal or cat tolerant. The first week that Buck spent with us, he was very quiet and unsure of his new surroundings. He's now into his second week, and there's a very noticeable difference in his behavior. He's much more sure of himself and he's starting to show a bit of his true personality. 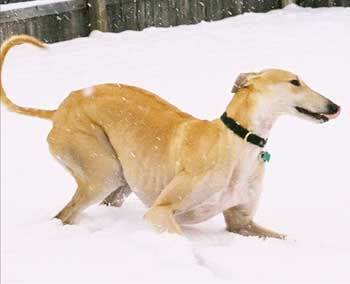 Buck does not seem to be an alpha dog, as he has not tried to establish dominance over our two male greys. Buck gets along very nicely with all four of our own dogs. Yes, we are crazy! We are currently a five-dog family. Buck shares his foster home with two older male greys, an older female grey, and finally our female lab, who is the boss of everybody. We are very impressed with Buck's manners. For a two year old, he's very easy going in the house. He does, however, love to play with stuffy toys. He loves to toss them up into the air and catch them on the way down. We anticipate more puppy-like behavior as Buck becomes more familiar with us and his new foster home. 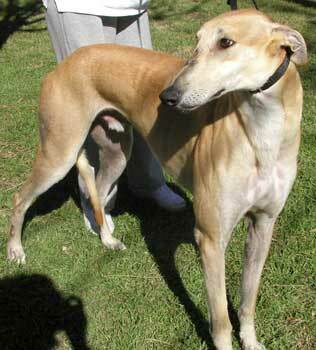 Buck is one very impressive young greyhound, and he is going to make some lucky family a wonderful pet.